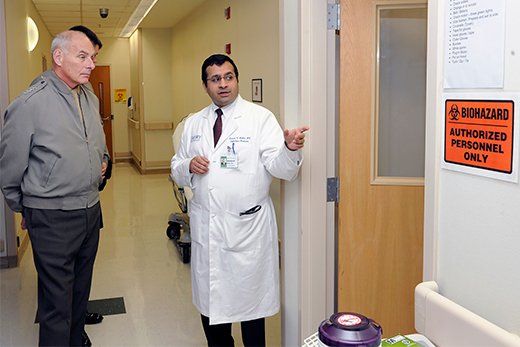 Dr. Aneesh Mehta explains to Gen. John F. Kelly the Emory Hospital special isolation unit's methods for disposing of contaminated materials. Photo by Jack Kearse. Dr. Maryrose Gerardi leads Marine Col. Mark R. Hollahan in a demonstration of a virtual reality therapy employed by Emory University School of Medicine's Trauma & Anxiety Recovery Program. Photo by Ann Borden. 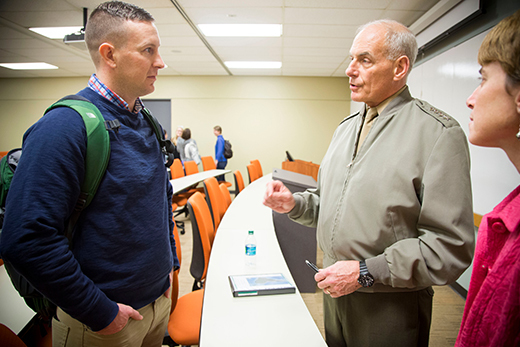 "We're in the business of what-iffing and worst-casing," General John F. Kelly said during a recent visit to the Emory University campus. With that in mind, Kelly and his staff spent a full day at Emory, touring facilities that exhibit how Emory contributes to the global community and advances initiatives that relate to his areas of influence. As the Commander of the U.S. Southern Command, one of five four-star generals charged by the president to lead the Department of Defense security cooperation in designated segments of the world, Kelly oversees Central and South America and the Caribbean Sea (except U.S. commonwealths, territories, and possessions) — some 16 million square miles. SOUTHCOM's priorities are transnational organized crime, counterterrorism, building relationships with the 46 countries and areas of special sovereignty under his purview, and detainee operations at Guantanamo Bay. Kelly's priorities are interconnected, though, and he approaches them with a commitment to work collaboratively with other agencies toward the goal of security throughout the region. Kelly visited Emory on March 4 as a guest of Emory Law's International Humanitarian Law Clinic and at the request of his good friends John M. Dowd 65L and Carole L. Dowd 65L. The International Humanitarian Law Clinic works directly with international tribunals, militaries, non-government organizations and other entities to enhance legal protections during wartime and ensure accountability for war crimes, genocide, and crimes against humanity. In particular, under Professor Laurie Blank's leadership and building on Kelly's prior visit to Emory in 2009, the IHL Clinic has forged a unique relationship with the United States Marine Corps, providing assistance in incorporating law of armed conflict and rule of law components into training and education curricula and programs. 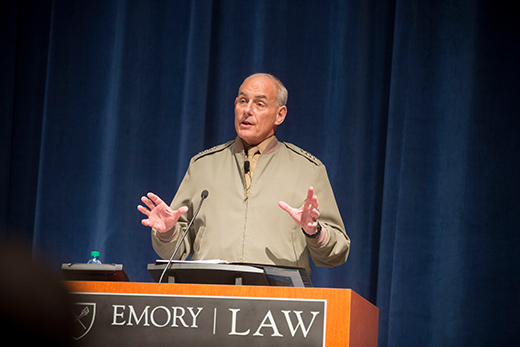 During Kelly's public address at the law school, and in a talk in Blank's National Security Law class, the general offered insight on the role of law in military and security operations, telling students and other attendees that virtually everything he does in his position has legal implications — which is why, as he quipped, he keeps a lawyer in his back pocket. Kelly highlighted the dangers posed by the drug cartels in Central and South America, including links to international terror. Beyond security concerns, America has a moral responsibility to help, Kelly said, suggesting that the next time drug users hear about the violent acts committed by cartels, they should look in a mirror and assess their own fault. "We're a society of wonderful, caring people; but the average Americans who use cocaine don't understand what that drug use affects in Honduras, for instance," Kelly said. "They don't see themselves as contributing to this breakdown in society." Security, public health and public safety — the spread of Ebola affects them all, and Kelly keenly explored those issues when he toured the Emory University Hospital special isolation unit with infectious disease specialists Dr. Aneesh Mehta and Dr. G. Marshall Lyon III. Established in conjunction with the Centers for Disease Control, the unit treated the first patients with Ebola virus disease in the United States. The doctors briefed Kelly on the detailed process for doffing high-level personal protection equipment and the disposal of contaminated waste. Together, Kelly, his staff and the Emory doctors explored best practices for addressing a range of potential and problematic scenarios, including an Ebola outbreak in a Central or South American country and the corresponding mass migration to the U.S. that would inevitably follow. Kelly also visited Emory University School of Medicine's Trauma & Anxiety Recovery Program. Post-traumatic stress disorder remains a concern of both military leaders and the psychiatric community. Kelly met Dr. Barbara Rothbaum, director of the program, to discuss ways to address PTSD, including early intervention exposure therapy and the possibility of identifying genetic biomarkers for the disorder. 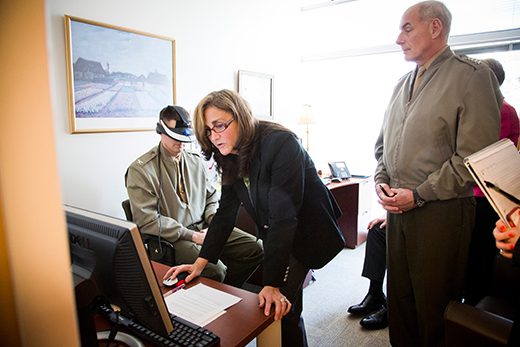 Marine Col. Mark R. Hollahan, Kelly's director of logistics, tried the center's virtual reality therapy program, calling it "extremely realistic" and "fascinating." The program recreates specific scenes from Iraq or Afghanistan, allowing a patient to relive the traumatic moment in detail with the help of a trained therapist. Kelly emphatically agreed that there is a need to spread the word about the help that is available to soldiers suffering from PTSD and to help remove the stigma that accompanies the diagnosis, and he offered his help in those efforts. Effectively encapsulating these key Emory initiatives and the day's discussions during his public lecture at the law school, Kelly emphasized that, in his estimation, the U.S. is the "biggest proponent and practitioner of human rights" in the world; but individuals must contribute for this to remain so. "My pitch is not to join the military," he said. "My pitch is to serve your country in some way. Be part of this great nation. There is a lot of work to be done out of uniform." Robert Schapiro, dean of Emory Law and Asa Griggs Candler Professor of Law, said Kelly's visit to the law school underscores Emory's mission. "Emory's work on international law and armed conflict through the IHL Clinic offers unique opportunities for engagement with the U.S. military on rule of law issues," Schapiro said. "Kelly's visit highlights this cutting-edge example of Emory's mission to promote the rule of law at home and abroad."